Floyd Burdette Schwartzwalder was born on 2 June 1909 in Point Pleasant, Mason County, West Virginia. He was known as Ben. He and Ruth F. Simpson were educated at West Virginia University. He married Ruth F. Simpson, daughter of James Laurel Simpson and Mary Louise Prenatt, on 16 March 1934 in Morgantown, Monongalia County, West Virginia, by license issued the same day, with A. C. Young, Minister of First Christian Church, officiating. At the time of their marriage, both were teachers, the groom residing in Pt. Pleasant and the bride in Morgantown. Floyd Burdette Schwartzwalder and Ruth F. Simpson appeared in the US federal census of 1 April 1940 in Parkersburg, Wood County, West Virginia, at 1705 Spring Street. Other members of the household included Hattie Stewart and Mary Louise Prenatt. In 1935 Ben and Reggie and Ben's mother were living in rural Tyler County, and Reggie's mother was living in Morgantown. He was employed as a football coach in a public school, according to the 1940 census. He served as a paratrooper in the Army’s 82nd Airborne during World War II, participated in D-Day in 1944, and achieved the rank of major. He was head football coach at Syracuse University. from 1949 to 1973. The following appeared on 29 April 1983 in The New York Times: Ben Schwartwalder, who recruited a series of acclaimed running backs as he restored Syracuse to football glory during 25 sparkling seasons that included an undefeated campaign in 1959, died yesterday at Northside Hospital in St. Petersburg, Fla. He was 83. Mr. Schwartzwalder, a resident of Syracuse who maintained a winter home in St. Petersburg, died of a heart attack, his wife said. When Floyd Burdette Schwartzwalder (Ben was a childhood nickname bestowed by a brother) arrived at Syracuse at the age of 41 in 1949, he was not at all what the alumni had hoped for to revive their football program. Syracuse, once a national powerhouse, had won all of nine games over the previous four seasons, and Schwartzwalder, a former high school coach whose collegiate career consisted of three seasons at tiny Muhlenberg College in Allentown, Pa., seemed hardly the man to turn things around. As Schwartzwalder later put it, "The alumni wanted a big-name coach. They got a long-name coach." 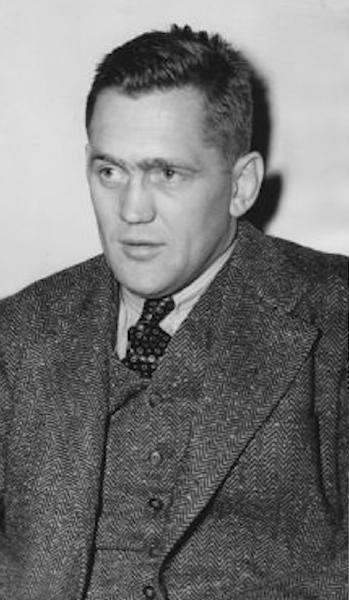 But Schwartzwalder, a decorated World War II paratrooper, simply went to work developing a program that made him the most victorious coach in Syracuse history, with a record of 153-91-3. Although he later became famous for his recruitment of a long line of talented running backs -- including Jim Brown, Ernie Davis, Jim Nance, Floyd Little and Larry Csonka -- Schwartzwalder's success was founded on an earlier triumph, persuading the Syracuse chancellor, William Pearson Tolley, to increase the number of football scholarships from 12 a year to eventually 25 a year. As the number of scholarships increased, Schwartzwalder, an honors student during his years playing football and wrestling at the University of West Virginia, did not chafe under the directive that he recruit only academically qualified players. He said good students generally made better athletes, anyway. So did a good coach. His running offenses, based on an unorthodox unbalanced line, were impenetrable to rival coaches, and his practices, generally conducted at full tilt, were all but unbearable to his players. Schwarzwalder became a campus legend for his absent-mindedness (he once wore his pajama bottoms to a morning practice), but it was a foible with an advantage. As his wife once explained, "He simply refuses to clutter up his mind with anything but football." The concentration paid off. In 1959, the year the Orangemen were voted the nation's top team after capping an 11-0 season with a 23-14 victory over Texas in the Cotton Bowl, Schwartzwalder was named coach of the year. The offense led the nation, averaging 313.6 rushing yards, 451.5 total yards and 39 points a game, and the defense led the nation in holding opponents to just 96.2 yards a game and only 19.3 rushing yards. Mr. Schwartzwalder, who retired after the 1973 season, is survived by his wife, Ruth, known as Reggie; two daughters, Mary Scofield of Winesburg, Ohio, and Susan Walker of South Salem. N.Y., and five grandchildren. Floyd Burdette Schwartzwalder died on 28 April 1993 at age 83 in St. Petersburg, Pinellas County, Florida, at Northside Hospital. Ruth F. Simpson became a widow at his death.